After PAN and TAN, the income tax department has finally made up its mind to issue another number i.e. the Document Identification Number (DIN). According to a guideline brought out by the Central Board of Direct Taxes (CBDT), DIN will be mandatory for very notice, order, letter or any tax-related correspondence, including the filing of returns for 2010-11, with the I-T department by the taxpayers. DIN will be generated by the Income Tax Department and will be issued to the assesses from this month onwards. It will be a computer generated number and will have to be compulsorily used by both, taxpayers and tax officials. 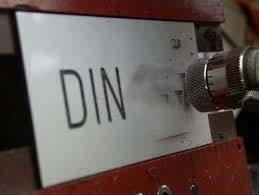 DIN will have to be mandatorily quoted in every incoming and outgoing communication with the Income Tax Department. Any return or document submitted by the assessee without mentioning the DIN will be invalid and be deemed never to have been submitted. Also, any order issued by the department without mentioning the DIN will be treated as invalid. Why DIN (Document Identification Number) ? DIN has been introduced to bring more transparency in the entire system of tax administration as the whole exercise of filing returns, assessment and claiming refunds involves a large number of documents and pro formas. To facilitate this process, a new section 282B was inserted by the Finance Act 2010 for the allotment of DIN. This system will be applicable on a pan-India basis thus streamlining the process of filing and processing of Income tax returns. As an assessee, you need not to bother. DIN will be issued by the department and communicated to you, However the procedural part as to whether the DIN will be available on the department’s portal or will it be provided by post, is still not very clear. Don’t forget to mention the DIN in the Tax returns for the Financial Year 2010-2011. Keep checking this space for more updates related to DIN. 7 Respones to "Document Identification Number (DIN) : a new number for taxpayers"
Oh, that's some new development. How come I didn't read it in the paper? Thanks for sharing it. will check ur blog for updates! LOTS ARE COMING UP TO SECURE CITIZENS.